Monday, February 11, native Binance token exchange has updated the historical maximum in relation to bitcoin, having risen in price to 0.0026880 BTC. It was the highest rate BNB against BTC for all six years of the existence of the coins. At the time of writing the exchange rate, the BNB has undergone a small correction and is trading around 0.0026000 BTC. 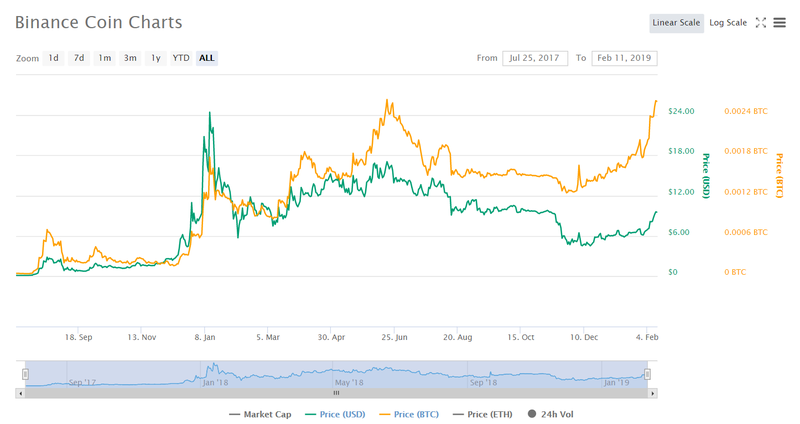 At the same time, if we talk about price Binance Coin against the U.S. dollar, the coin is still quite far from the maximum of 12 January 2018, when its average rate, according to CoinMarketCap, has reached $24.91. So, today, BNB, the maximum rose to $9.82. Note that Binance Coin shows a steady increase for the past several weeks. So, on Wednesday, February 6, BNB increased in price by more than 15% and up in the Top 10 of CoinMarketCap. It happened against the backdrop of the announcement of licensee project Fetch.ai on the platform Binance Launchpad and release a new version of a test network Binance Chain support hardware wallet Ledger. However BNB did not stop and continued climbing to new heights, not least thanks to the announcement about the integration of exchange Binance technology xRapid from Ripple. The growth rates of the BNB in relation to the dollar for the week amounted to 35%, and the capitalization of cryptocurrencies at the moment is $1.34 billion. We will remind, earlier CEO Binance, Chanpen Zhao said that the bitcoin industry needs entrepreneurs and projects that are not exchange-traded funds (ETFs).